Slow down there, li'l doggy… no one's going to grab your food! 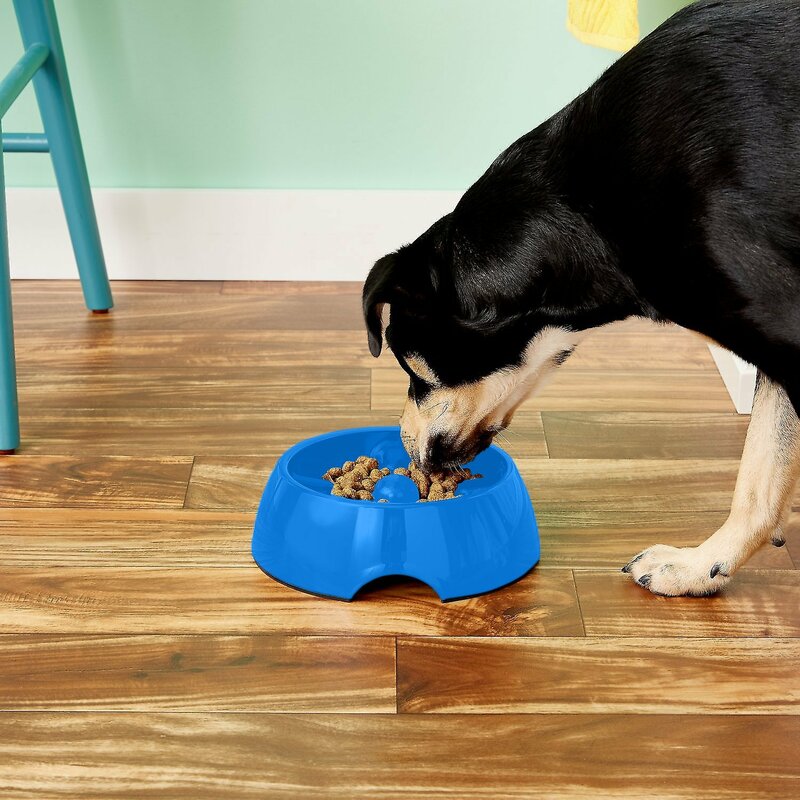 Pups who gulp their food to make sure no one else gets even a single piece of kibble often have problems with digestion or vomiting. 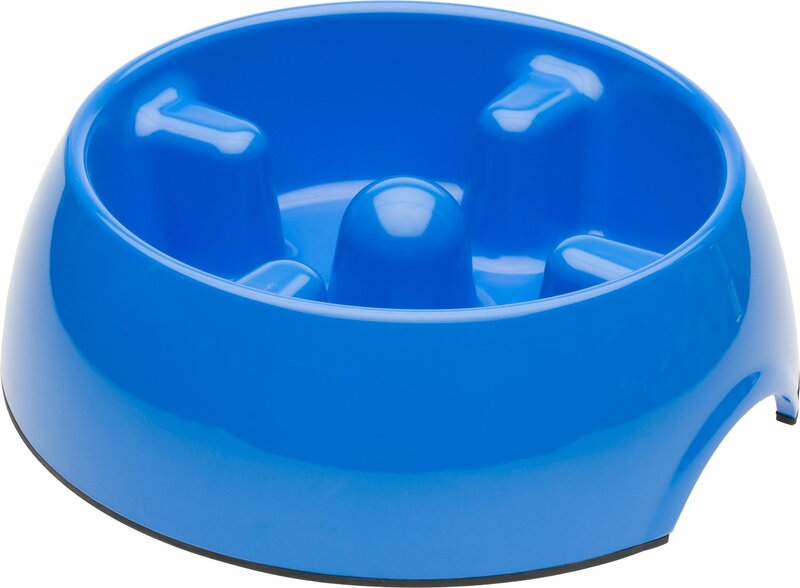 The Dogit Blue Go Slow Anti-Gulping Dog Bowl prevents pets from eating or drinking too fast thanks to the molded bumpers in the bowl. Encourages pet to eat or drink at a slower pace preventing indigestion, vomiting and bloating. Can be used to feed water, wet or dry food. Bowl is dishwasher safe for easy clean up. Available in multiple sizes for any size dog. Great solution for dogs who eat and drink too quickly. My 10 yr old Westie is only fed once a day, dinner time. So once I set his dish down, he would gobble all the food in aboout 10 seconds. After getting this sectioned bowl, it takes him usually about 3 to 5 minutes to finish. I mix his dry food with hot water and add Salmon oil and carrots in his old bowl, and then I divide it up into the four sections. It has really helped to slow him down. The bowl is weighted with a non-stick bottom so it does not move at all. Easy to clean. I hoped this bowl would work but the center post cracked and broke though. It seemed thinner at the center post. Not sure if defective but two uses and I went to pick up from my pup and noticed it was broken. We don’t leave the bowl in the pen after feeding so she didn’t use it as a chew toy. Very disappointing. I had a regular bowl then got a suction cup to fit in the bowl but it would come loose. I would still have to stand over her and back her off. I had heard about these bowls but never saw one in the stores. The suction cup I bought at Petsmart was 6.99 yours was only 3 something and the bowl was only 6 something. I can let her eat and don't have to stop her but I feed her wet and dry food and put it up the sides so she just doesn't gulp it down. When I got the bowl at first I thought it was too small but then I realized the bumps were nice and close to make it more difficult to eat. My girl was a puppy mill girl for 4 1/2 years so no telling how she had to get her food. I've tried 6 different slow feeding bowls for our 13 lb Jack Russell/Beagle Mix 1yr old and this is finally the one that's perfect. Made well and is sturdy. I bought the pink color and it's perfect. It's a light pink not really bright. Other slow feeders were either to big or too small of sections that irritated her nose. I actually hear her chewing instead of inhaling. My dog would eat so fast that she would almost regurgitate everything with in minutes after eating. This bowl has slowed her down, so that her stomach can receive what she has eaten. I am working on her training and this fowl has helped. Good bowl for our Golden. We have two Goldens. One eats fast, one eats slow. 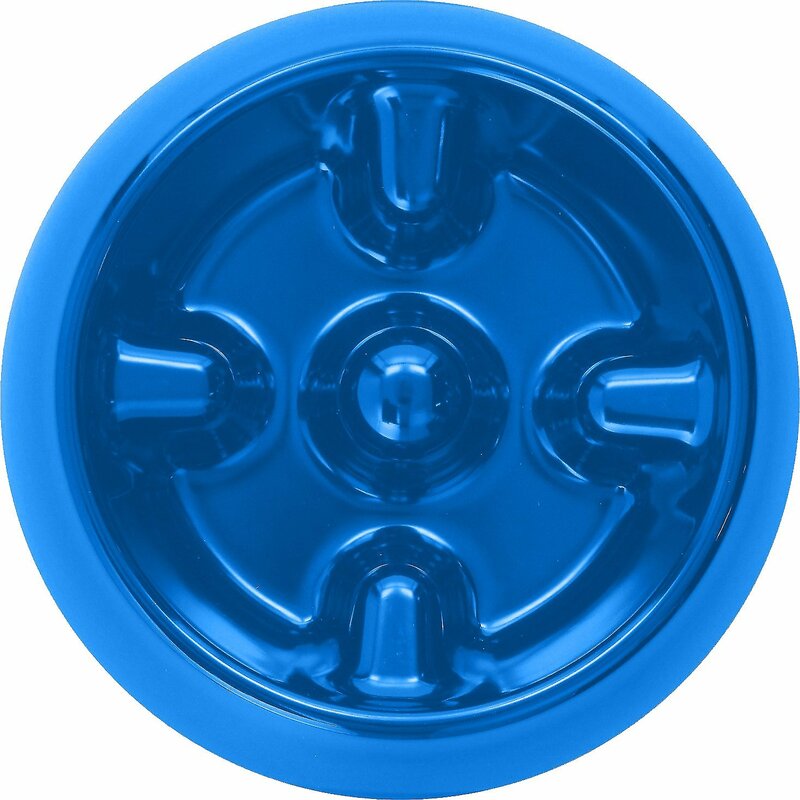 This bowl (small size) works well for the fast eater and keeps her from gulping her food. It probably holds about 1 & 1/2 cups of kibble which works fine for us. I am very pleased with this bowl. It is heavy, well made, and has a rubber slip-proof bottom rim. It has slowed my dogs eating greatly. I should have bought it a long time ago! I do think this bowl slows down my 2 yr old black lab a little bit over a regular bowl. He doesn't seem to sit there and act like he's trying to get the backlog to go down as much or at all. I chose this one because it was one piece and the other reviews. The material reminds me of melmac and is pretty easy to clean, have not put it in the dishwasher yet. Only giving four stars because while it works I thought it would work a little better, he still gulps the food in the sections and as time as gone on he's figured out that there are sections. So I'm not sure if this will work long term.